The chill of the outdoors doesn’t match the thrill of getting selected for Nationals for the second straight year. The University of Wisconsin-Stout men’s cross country team has qualified for Nationals for the second straight year. The team has been running hard all season long, and that run continues at Lake Breeze Golf Course in Winneconne, WI. “Getting back to Nationals is a pretty good feeling. Our team had a greater confidence going in from last year and returning most of the team that went last year makes it more attainable,” said senior Matt Lancour. Lancour goes on to say that one of the things that the team is doing well is staying consistent in their training, which helps them prepare for Nationals. “We also had adversity in racing conditions, where some other teams struggle like rain, snow, or mud,” said Lancour. The meet was held outdoors and with the temperature being quite cold, this created some challenges for the runners. Fortunately, Lancour has a plan. The Blue Devils were able to match what they did last year and finished in 22nd place out of 32 possible placements. 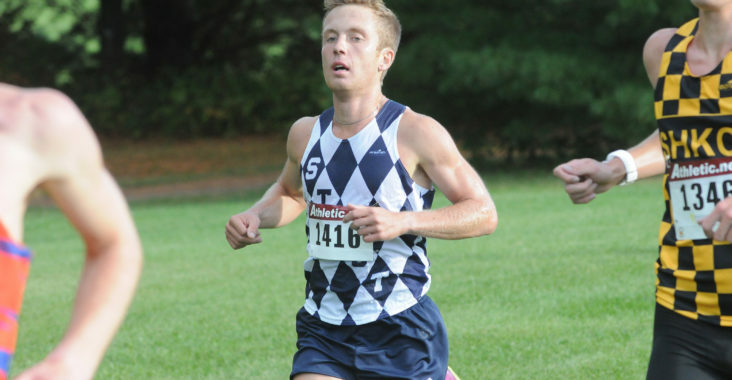 Senior Dan Ressler finished first among the blue Devils placing 99th overall and finishing with a time of 25 minutes and 37 seconds.